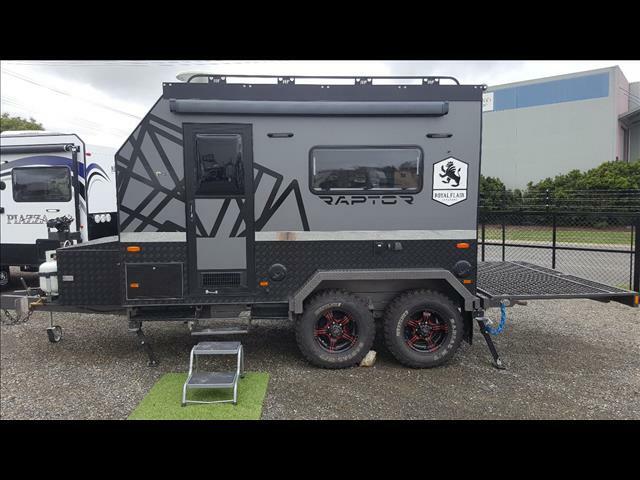 The Raptor is Royal Flair&apos;s newest caravan specifically designed and engineered for an adventure holiday in the tough outdoors. Combining a touch of luxury with the versatility of a trailer, The RAPTOR is encircled by a ten point roll bar that is fully customizable and can incorporate additional roof top storage options for kayaks, dinghies and all of your fishing equipment while the area above the draw bar has options for a front loading tray specifically designed for a quad bike or a dual motor cross dirt bike hitch carrier with loading ramps and cargo baskets. The Raptor comes standard with ample internal storage areas, generous sleeping quarters, a slide out kitchen with twin gas bottles, internal and external shower facilities with a 95L water tank and 150 watt solar panel for maximum power generating to ensure The Raptor is the perfect van for the adventure weekend away.